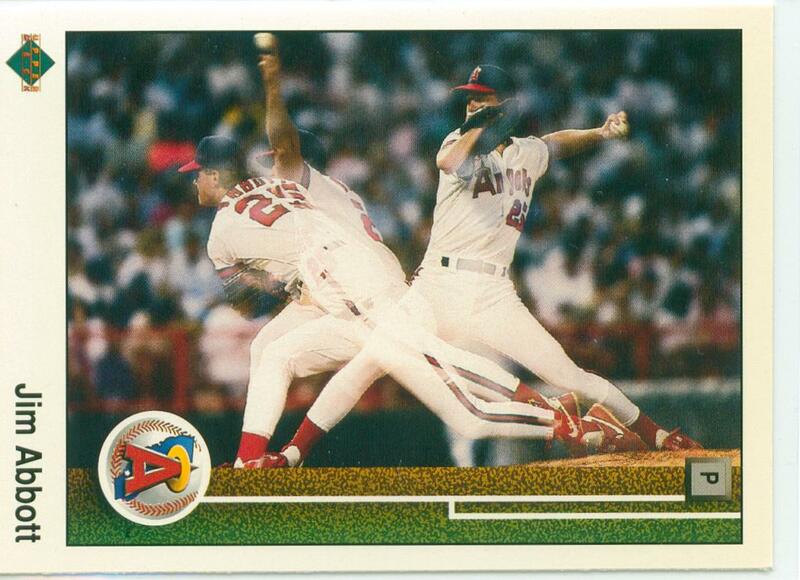 Now that my Jim Abbott player collection is complete, it is time to show of my favorite five cards from the set. In Upper Deck’s debut set they featured a few of these multi-image baseball cards. 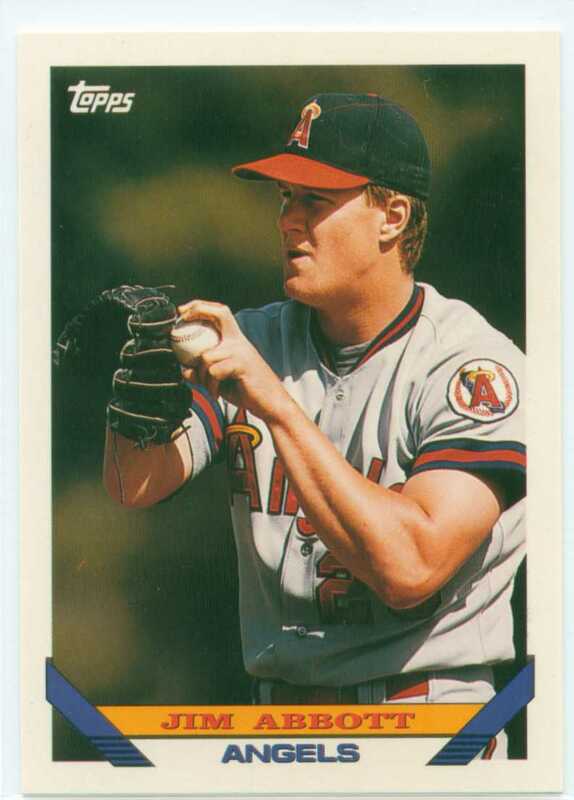 The ones that I am certain of are Nolan Ryan, Wade Boggs, and this one of Jim Abbott. The Ryan and Boggs cards make a lot of sense – these guys were established talents in the game. The Abbott card is a bit more mysterious as it is his rookie season and he had not real MLB following at the time of the release. But, as we all know, Upper Deck wanted to make revolutionary changes in the hobby (ie Ken Griffey Jr getting the #1 card in their first set). Abbott’s 1991 Topps Stadium Club card was number four on my list. And now his card from the 1992 set finds a home on the list too. The sam can be said about the 1992 that I stated about the 1991 card. I just like this image a little bit better!! The Stadium Club set was created to do direct competition with Upper Deck. Topps did a fantastic job of upgrading their photo quality, cardstock, and glossy finish with their Stadium Club brand. And if you peeled off the logo and lettering on these cards, you would have a perfect picture!! The 1993 Topps baseball card design is an underrated one – at least in my opinion. I like the card’s simple player name and team banners and I especially like the oversized photo. But, the photographer really took us in with this card. We get all of the details – from how Abbott held the glove on his non-pitching hand to the grips he uses on what appears to be a curve-ball. 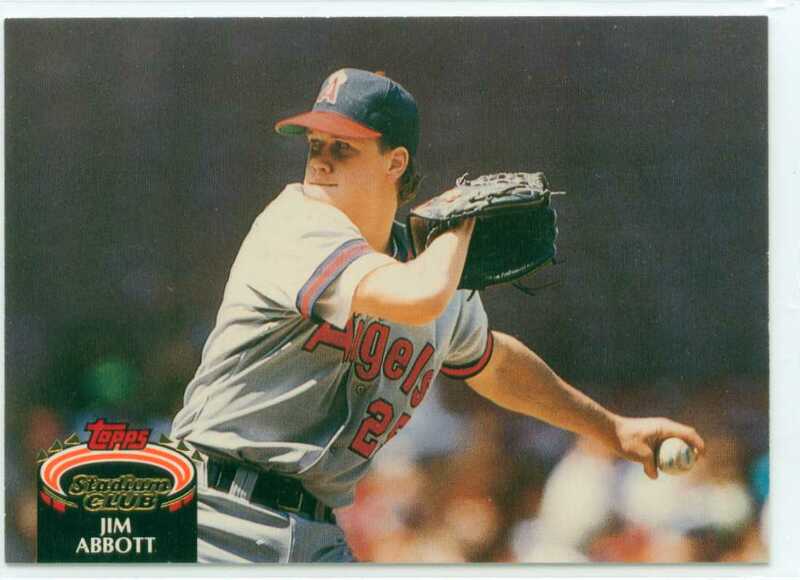 My Jim Abbott Player Collection Is COMPLETE!!! Oh, Yeah!! Well friends, another player collection has been completed at ’30-YOC’. 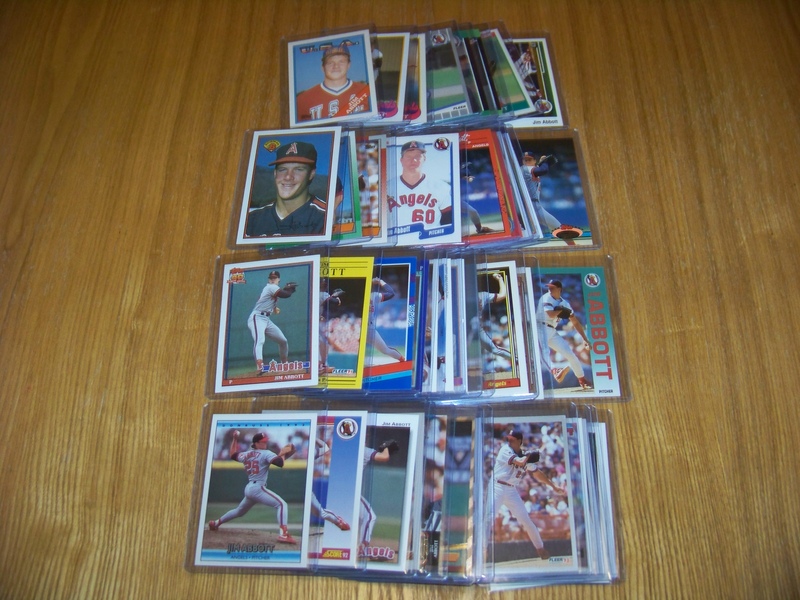 This time around, it is my Jim Abbott collection. And it was a lot of fun to build! This journey started in February of this year when I declared that I wanted to collect each and every major-branded baseball card of Abbott’s from his playing days for the California Angels. And I finally was able to add the last missing card to my collection when I brought home Abbott’s 1989 Upper Deck rookie card. And now, the set is D-O-N-E!!! That is a pretty solid collection of cards right there. Abbott’s career began just as the boom of baseball cards brands took place. And while this collection spans just six baseball seasons, it boasts 40 baseball cards. And as I do with all of my newly completed player collections, I will show off my ‘Fab Five’ from my Jim Abbott collection next week. Starting on Monday and ending on Friday, you will see the five cards from this set that in my opinion are the cream of the crop. 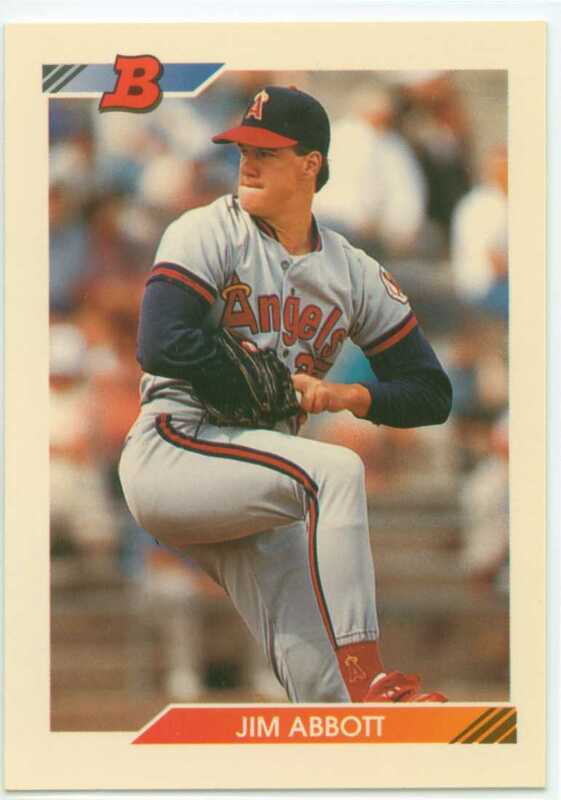 Jim Abbott 1989 Upper Deck – ROOKIE CARD!!! My friends, I am very proud to be able to announce to you this morning that I have finally collected each and every Jim Abbott rookie baseball card. I’ve got the Topps, the Fleer, the Donruss, the Score, the Bowman, and now the Upper Deck!! The journey has been a long one, but one that I have enjoyed being on. 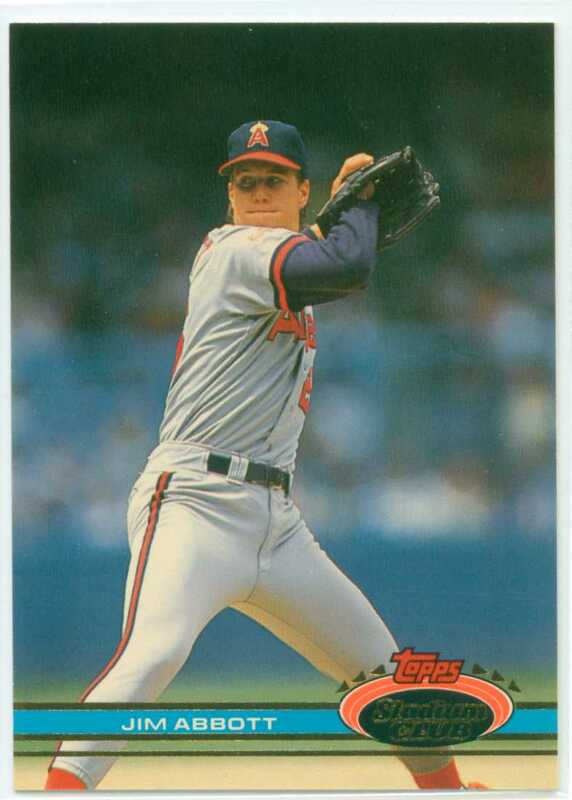 And let me just say, this Upper Deck rookie card of Jim Abbott is superb! Abbott really got special treatment with his 1989 Upper Deck baseball card. The multi-image shot was usually reserved for All-Stars and legends. The 1992 Bowman set receives a lot of praise. Partly due to the rookie cards that are part of the set, and partly due to the minimalist design, the cards just look great. They offer nice, large photos. The famous Bowman ‘B’ is front and center. And the colors of the graphic banners do not do anything to draw your attention away from the photo. I will admit that it is a little weird to not have the team name and player’s position on the front of the card. But besides that, I have no complaints!